One Buddhism? or Multiple Buddhisms? The New Year is not a particularly Buddhist celebration. People of various cultures and religious traditions throughout the world celebrate the New Year with rites of remembrance and renewal. For the most part, New Year’s rites are observed at home. And yet here in America, Buddhist immigrants from Asia often visit their temples on the occasion of the New Year. The celebration of the New Year with parades, bazaars, feasts, and music is, indeed, one of the year’s great festivals for these communities. The Chinese New Year is observed on the first day of the first lunar month of the year. It may fall anywhere between January 20 and February 19 of the Gregorian calendar. The Chinese New Year may be the occasion for a Lion Dance through the streets of Chinatown, or for visiting the temple to honor the ancestors, to offer prayers, and to engage in fortune-telling and seeking clues about prospects for the upcoming year. At America’s great Chinese temples, such as Hsi Lai in Hacienda Heights, California, this is the busiest day of the year, with thousands of celebrants. Indeed, the week before the Chinese New Year, the temple invites the entire surrounding neighborhood for a special dinner at the temple to say “thank you” in advance for putting up with the traffic and crowds that inevitably accompany the celebration. On New Year’s Day, all of the surrounding streets are packed with cars, and the kitchen staff is hard-pressed to keep up with the steady stream of diners in the spacious temple dining room. For many Chinese-Americans, this is the only time they come to the temple. Though most of the monks and nuns at Hsi Lai consider fortune-telling a superstitious anachronism, on New Year’s Day they have no choice but to interpret the brief and sometimes cryptic messages, rolled up in tiny plastic tubes and purchased for a small donation. A New Year celebrant takes her fortune-message to one of the nuns. The small piece of paper says: “Fame and ill-fame have no standard, let them be. Ups and downs are one’s fate. Don’t blame others. If we can learn to be humble, our mind will be at ease. With no attachments to extravagance, our nature will be pure.” Much to contemplate for the coming year! The hundreds of impromptu encounters for interpretive spiritual guidance leave the monks and nuns exhausted by day’s end. In Thailand, the first day of the solar calendar is observed as Songkran Day, calculated to be when the sun passes from Taurus to Aries, a date which usually falls in late March or April. Cleaning and sweeping the temple grounds, bathing the images of the Buddha with perfumed water, renewing the images with gold leaf—all this signals the renewal of the New Year. Indeed, this is the only day during the year when water is poured upon the image of the Buddha. The day is also one for merit-making by sprinkling scented water on the hands of a respected monk or elder, making special donations to the temple, or releasing captive fish or birds as an act of compassion. Inside the temple, the dead are also remembered. Their names are given to the monks and placed in a large incense burner. At the conclusion of the festival, the names of the whole company of the dead will mingle with the smoke of the incense. The monks receive the gifts from the laity and sprinkle a blessing of water over their heads. Songkran is also, of course, a great cultural celebration. 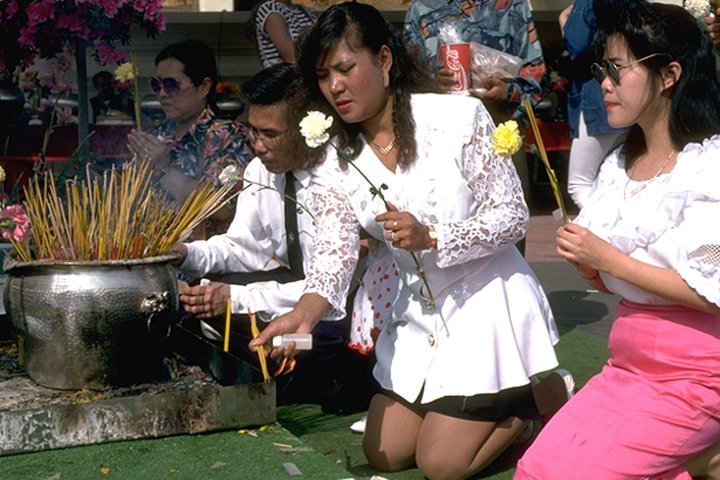 In Thailand, there are three days of festivity, and often the sprinkling of the lustral waters of the New Year becomes a wild “water festival” in which celebrants sprinkle and douse one another with cups and buckets of water. 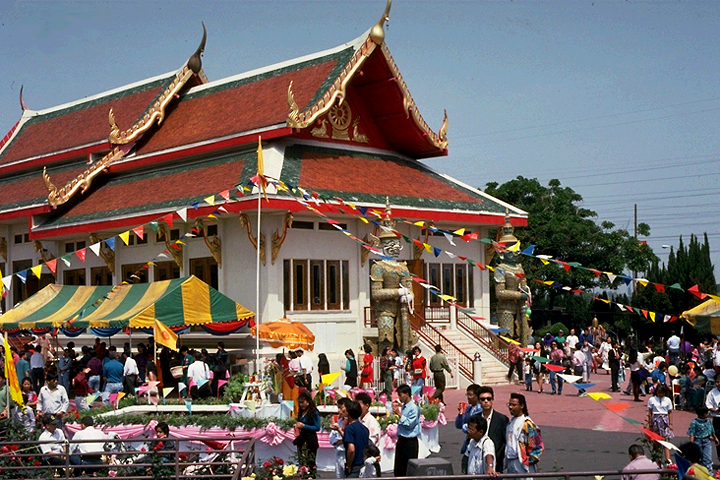 This celebratory aspect is preserved in the Thai temples of America, where Songkran is invariably one of the year’s most important holiday observances. Perhaps the water-dousing is more subdued, but there are band concerts and dance performances. Dignitaries cut loose a bouquet of balloons. Women sell raffle tickets for a new car. Teens enjoy a rock band and a beauty contest. And there is a lavish food bazaar, its booths sizzling with skewers of chicken, pork, and beef. 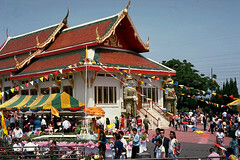 There are egg rolls, noodle soups, and other traditional Thai delicacies. The monks in their robes, the fashionable teenagers in their jeans, and the grade-schoolers in their superhero-themed sweatshirts all mingle freely.